The lawyer who wanted to justify himself asked Jesus the question of who is our neighbor? Jesus reply teaches us our neighbor is more than the one who lives next to us in a neighborhood, but it is how we have compassion and concern for another human being in the story of the “Good Samaritan”. (Luke 10:27-37). And he answering said, Thou shalt love the Lord thy God with all thy heart, and with all thy soul, and with all thy strength, and with all thy mind; and thy neighbour as thyself. And he said unto him, Thou hast answered right: this do, and thou shalt live. But he, willing to justify himself, said unto Jesus, And who is my neighbour? And Jesus answering said, A certain man went down from Jerusalem to Jericho, and fell among thieves, which stripped him of his raiment, and wounded him, and departed, leaving him half dead. And by chance there came down a certain priest that way: and when he saw him, he passed by on the other side. And likewise a Levite, when he was at the place, came and looked on him, and passed by on the other side. But a certain Samaritan, as he journeyed, came where he was: and when he saw him, he had compassion on him, And went to him, and bound up his wounds, pouring in oil and wine, and set him on his own beast, and brought him to an inn, and took care of him. And on the morrow when he departed, he took out two pence, and gave them to the host, and said unto him, Take care of him; and whatsoever thou spendest more, when I come again, I will repay thee. Which now of these three, thinkest thou, was neighbour unto him that fell among the thieves? And he said, He that shewed mercy on him. 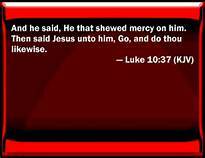 Then said Jesus unto him, Go, and do thou likewise. Even though all the law is fulfilled in that we are to love our neighbor as ourselves, bad neighbors exist in some places yet it is written if arguing pursues that as a Christian we are not to devour one another and in the spirit of God know we are to walk in the spirit of love as the flesh is contrary to the righteousness of God! (Galatians 5:13-17). For, brethren, ye have been called unto liberty; only use not liberty for an occasion to the flesh, but by love serve one another. For all the law is fulfilled in one word, even in this; Thou shalt love thy neighbour as thyself. But if ye bite and devour one another, take heed that ye be not consumed one of another. This I say then, Walk in the Spirit, and ye shall not fulfil the lust of the flesh. For the flesh lusteth against the Spirit, and the Spirit against the flesh: and these are contrary the one to the other: so that ye cannot do the things that ye would. We are to always do what is right towards our neighbor and this is so important it is a commandment needed to be followed for things to go well with us. ( Leviticus 19:13,15-18). Thou shalt not defraud thy neighbour, neither rob him: the wages of him that is hired shall not abide with thee all night until the morning. Ye shall do no unrighteousness in judgment: thou shalt not respect the person of the poor, nor honor the person of the mighty: but in righteousness shalt thou judge thy neighbour. Thou shalt not go up and down as a talebearer among thy people: neither shalt thou stand against the blood of thy neighbour; I am the Lord. Thou shalt not hate thy brother in thine heart: thou shalt in any wise rebuke thy neighbour, and not suffer sin upon him. Thou shalt not avenge, nor bear any grudge against the children of thy people, but thou shalt love thy neighbour as thyself: I am the Lord.